Gerard Farrés maintains his steady and relentless pace through Dakar and finishes yet another good stage, gaining positions in the overall classification to solidify himself in eigth place. Another great stage by Dani Oliveras, who overcame a mechanical problem and was able to keep up with the leaders’ pace, finishing the day within the stage’s Top 20. Solid day as well for Marc Solà, Iván Cervantes and Rosa Romero, which allows the HIMOINSA Team to stay in the race with all its riders, in this decade’s toughest and most selective Dakar. Arequipa (Peru). This fifth stage of the 2018 Dakar was highlighted in red by all the riders even before taking the start. In view of the harshness imposed by the Peruvian desert, the 266 kilometers of special through the giant dunes of Tanaka, could prove to be deadly for the chances of many favorites. 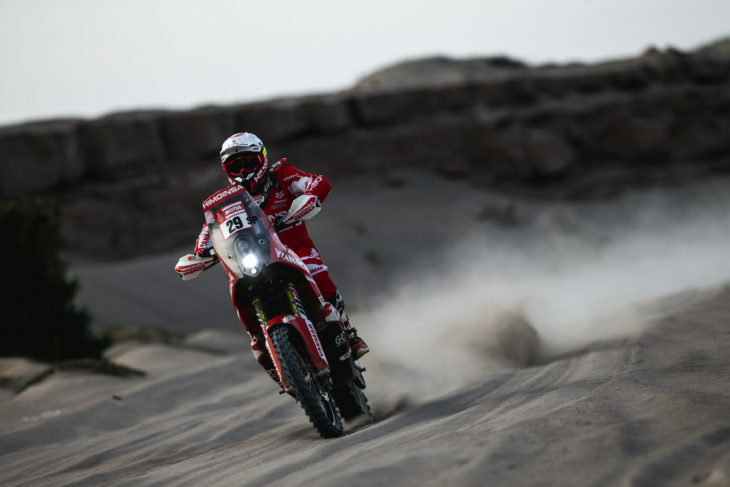 However, Gerard Farrés started the day with an incredible pace, which placed him as the second fastest rider for a considerable part of the stage, keeping up with the incredible pace of the stage winner, Joan Barreda. On his route, the HIMOINSA Team rider came across Dani Oliveras, who started a few minutes before and had to fix an oil leak which cost him 10 minutes. From that moment on, until the end of the stage, the two riders rode together, with a very good pace which allowed them to reach the finish line among the best, gaining more positions in the overall classification. This allows Farrés to be the best private rider of the race for another day, keeping up with the factory bikes. Another highlight of the day was Marc Solà’s best stage result of 2018, finishing twenty-fifth. Meanwhile, Iván Cervantes and Rosa Romero once again demonstrate their regularity, and allow the HIMOINSA Team to stand out as one of the most solid teams (and the best private team) in this gruelling test for the participants, which is the toughest Dakar of recent years.